It's easy to get caught up in the tale about Dracula while driving along winding roads through dense, dark, ancient forests, deep valleys and over mountain passes in Transylvania. It was the writer and novelist Bram Stoker who in the 19th century really put Transylvania on the map and made Dracula famous through his novel "Count Dracula" - the world's most famous vampire! It made me wonder who was the real person who inspired Bram Stoker, and which places has Dracula sat his footprints. Photo. 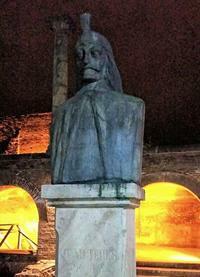 Statue of Vlad Tepes stands outside the court complex, Str Franceza, on the southern edge Old City, where you will find the remains of the Old Princely Court and Old Princely Court Church. Transylvania in Romania is best known as the mysterious land of Dracula and bloodthirsty vampires, also howling wolves and roaring bears. Taking the extra step to the east by the Carpathian Mountains, ‘the land beyond the forest’, still feels undiscovered and amazing. Dracula is an 1897 Gothic horror novel by Irish author Bram Stoker. Famous for introducing the character of the vampire Count Dracula, the novel tells the story of Dracula's attempt to move from Transylvania to England so he may find new blood and spread the undead curse, and the battle between Dracula and a small group of men and women led by Professor Abraham Van Helsing (source: Wikipedia). Bram Stoker’s Dracula novel was published in Romanian for the first time in 1990. A numerous movies have been produced inspired by his novel, both for adults and children. The legend of Dracalu is highly living, but who was the person behind the legend? Which places are associated with Dracula? In April 2015 I followed Dracula's bloody footprints around in Romania: Sighișoara near Sinaia where he was born, the Old Princely Court (Palatul Curtea Veche) in Bucharest, Snagov Monastery where his remains according to legend were buried; the ruins of the Poenari Fortress - considered to be the authentic Dracula's Castle; the village of Arefu where Dracula legends are still told, the city of Brasov where Vlad led raids against the Saxons merchants, and, of course, Bran Castle, also called Dracula's Castle. Dracula ruled many places and his footprints is today highly visible. First I started my exploration along Str Franceza, on the southern edge Old City in Bucharest. Here I could observe remains of the Old Princely Court and Old Princely Court Church. The court served as the early seat of the Wallachian princes, including for a time a ruthless young ruler named Vlad Tepes (aka Vlad the Impaler), who later served as the inspiration for Bram Stoker’s Dracula. Outside the court complex I observed a huge shine statue of Vlad Tepes, which looked pretty scary to me. The church here is Bucharest’s oldest, dating from 1546 and the reign of Mircea the Shepherd. It is free to enter and the frescoes next to the altar are 16th-century originals. The infamous Romanian ruler Vlad Țepeș was called by several names: Vlad III, in full Vlad III Dracula, and Vlad the Impaler. He was born in 1431 in Sighișoara, Transylvania, in Romania. Sighisoara is a medieval fortress with architectural ensembles made in a rural Gothic style, but also in Renaissance and Baroque styles, which are the result of a constructive effort appeared later in the sixteenth and seventeenth century. The house in which he was born still stands today although it is much changed from the time when Vlad was there. The house he lived in would have been extremely basic lacking plumbing and sewage disposal but he would have had very thick walls which would have been extremely necessary for survival. Bran Castle, Romanian: Castelul Bran, situated near Bran and in the immediate vicinity of Braşov, is a national monument and landmark in Romania. The fortress is situated on the border between Transylvania and Wallachia. Commonly known as "Dracula's Castle" although it is one among several locations associated with the Romanian great vampire. Vlad Dracula is reputed to have performed such horrific acts as disembowelling his pregnant mistress as well as collecting the noses of 24,000 of his beaten enemies in order to send them to another foe! Even by the standards of his time, he was exceptionally cruel. It cannot however be denied that Vlad left a legacy of fortified palaces and castles which he inherited and greatly developed and which have survived through the centuries. In spite of his many cruelties, in Romania Vlad Dracula is remembered today as a national hero. Transylvania is part of the east European country of Romania - a land full of mystery and legend, an area dominated by great mountain ranges and mysterious castles. Check out Facebook page and watch photos from Romania. Read more about the real person Dracula on Romania Tourism`s website. Information about Dracula Castle: Medivial castle. and dried iboga root barks) for sale. We are potential producers of Iboga root barks and Ibogaine hcl. If interested in buying this product feel to contact us .